Creamy milk caramel, sandwiched between two crisp and buttery shortbread cookies. 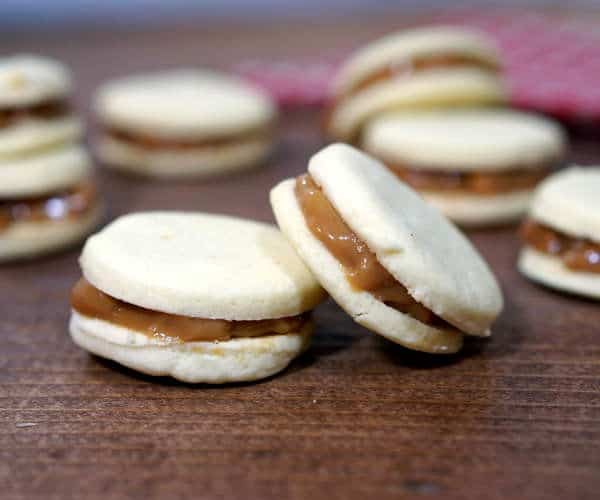 These Argentinian Dulce de Leche Cookies are a recipe worth indulging in. Alfajores (pronounced AL-fa-HO-res) are a sandwich cookie that is incredibly popular in Argentina and all over Latin America. They are so well-loved that they are widely considered the national cookie of Argentina, where you will find these sweet treats eaten not only as a dessert or snack, but also at breakfast with coffee or tea! 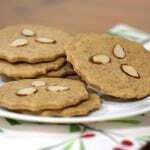 It is believed that these sweet and crumbly cookies have been enjoyed for over 100 years. 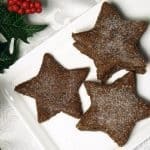 They were brought to Latin America from Spain, where they are a traditional Christmas cookie. However, the name is the only similarity between the Spanish and Latin American cookie today. 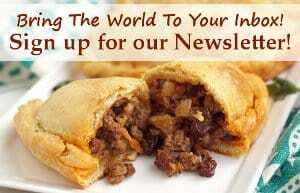 While the Latin American adaptation cuts the cookie dough into rounds when then form a sandwich with the creamy Dulce de Leche, in Spain, the dough is shaped into a small tube shape, creating a longer, crispy cookie, without any creamy filling. 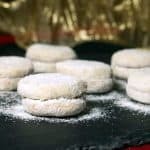 Spanish Alfajores are made with honey, almonds and spices, and they are crumbly, but not quite the melt-in-your-mouth sandwich cookie that they became in Latin America. 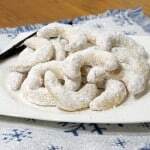 The Latin American version that we are sharing with you today starts with two crisp and crumbly shortbread cookies that get a unique texture from the use of cornstarch as well as flour. The cornstarch is what gives the cookies their incredibly crumbly texture. The cookies themselves are only mildly sweet, which is perfectly acceptable because they are sandwiched with a milk caramel (literally “candy milk”) called Dulce de Leche (pronounced DOOL-seh deh LEH-tcheh). We love the way the crumbly texture of the cookies contrasts with the smooth and creamy Dulce de Leche. The cookies are so crumbly, that you must be careful to fill and sandwich them while still slightly warm, so they don’t crack and crumble. 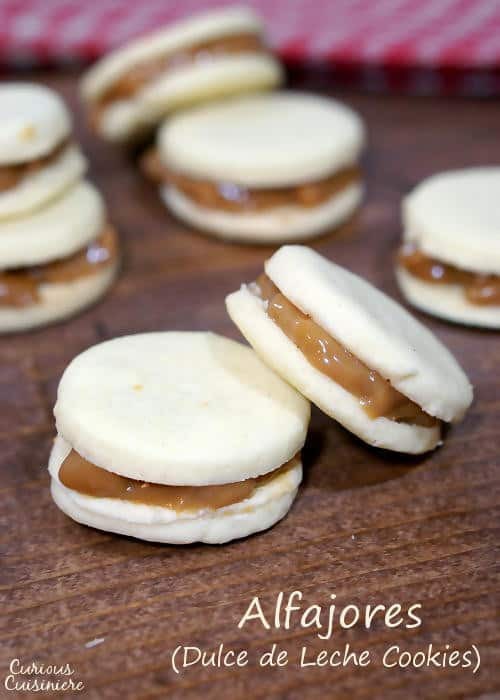 However, once the sandwiches set overnight, the cookies start to absorb moisture from the Dulce de Leche filling, softening them just enough and giving them an incredibly rich feeling in your mouth with each bite. Recipe yields 1 doz (1 ½ inch) sandwich cookies. If you are making your own Dulce de Leche, we recommend starting it at least 5-6 hours before your cookies will be ready to fill. In a medium bowl, cream butter and sugar with an electric hand mixer. Add the egg yolk, lemon zest, and brandy. Beat until smooth and fluffy. In a separate bowl, mix cornstarch, flour, and baking powder. Sift the dry mixture into the butter mixture and beat over low speed until the mixture looks like even, wet crumbs. Using your hands, knead the mixture just until it forms a dough that will hold together. Shape the dough into a ball and wrap it in plastic wrap. Place the dough in the refrigerator for at least one hour, up to 3 days, to let the flavor develop. When you are ready to bake your cookies, preheat your oven to 350F. 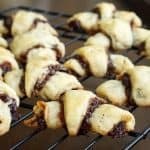 Roll the dough ¼ inch thick and cut it into circles using a 1 ¾ inch cookie cutter (or the mouth of a shot glass), Re-roll any dough scraps and cut additional cookies. You should have 24 cookie dough rounds. Place the cut dough onto a baking sheet, ½ inch apart. When the cookies are done, remove them from the oven and let them cool for about 1 minute on the baking sheet. Then, transfer the cookies to a wire rack to cool completely. When the cookies cool to room temperature, place roughly 1 tsp of Dulce de Leche on one cookie and top it with a second cookie. Press down gently and evenly, so that the cookies do not crumble. Enjoy the cookies immediately to really appreciate the crisp and creamy texture contrast, or store for up to 1 week in an air-tight container for the cookies to absorb some flavor and moisture from the Dulce de Leche. * To make homemade Dulce de Leche: Place one can of sweetened condensed milk (with the label removed) in a large pot of water (be sure the water comes at least 1 inch above the can. Gently boil the water for 2-3 hours (2 hours gives a lighter Dulce de Leche, 3 hours gives a deeper colored Dulce de Leche like we used in our pictures). After the time is up, remove the can from the water with a pair of tongs and place it on a wire rack to cool completely before opening. Any leftover Dulce de Leche can be stored in the refrigerator for 1-2 weeks. Use leftovers with ice cream, as a cake filling, or anywhere you would use traditional caramel syrup. Mcewen TN, Daisies, Troop 147 is going try this recipe for our World Thinking Day! Wish this Troop leader luck and I will let y’all know how she goes. These will be so fun for a Daisy troop! We hope the girls enjoy them! Hi Brandy, These are quite small cookies. Is is possible that you didn’t roll your dough all the way to 1/4 inch thick and/or cut them into small, 1 1/2 inch round cookies? We’re glad you’re still able to make them work for the troop. The dulche de leche filling is tasty with any cookies. That’s for sure! Alfajores are the best. You can sprinkle with powdered sugar or coconut. But I have one comment/correction. Dulce de leche is a South American confection made with cow milk. The Dulce from Mexico is generally goat’s milk and has a distinct flavor from Argentine Dulce de leche. You can also speed up the process if you have a Pressure cooker. It’s done in less than an hour without any hassle! Hi Shelia. Thank you so much for your note on Dulce de Leche. That is quite fascinating that it differs between Mexico and South America. So deliciously different! 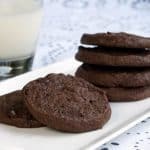 I loved reading about these cookies! Yum! These look delicious! These cookies are on my bucket list. Definitely need to try them soon. Thanks Tara! 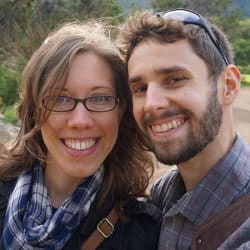 Your family would love them! Beautiful description of these beautiful sandwich cookies! 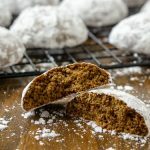 The kids at school and I made these a month or so ago – SO delicious! These would be so fun to make with kids. I bet they loved them! I love these. 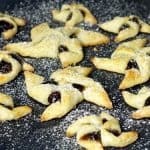 I’ve had them before but never made them myself, and now I am craving them so I think I must! Great cookie pick! Thanks Nicole! Even though there are a few steps, they really are quite easy to make! Alfajores are one of those cookies I still haven’t gotten around to baking. Yours look amazing. Gotta love that dulce de leche. Oh yes! Dulce de leche really makes these cookies outstanding! Those look amazing! Perfect for the holidays! Oh, boy, I’d be so busy sampling that filling that these delectable cookies might never get filled! What a yummy recipe! Yeah… there was quite a bit of filling sampling going on in our kitchen!